When your children have a peculiar obsession with eating only white food, cooking at home while travelling is something of a necessity. The process is not without it’s challenges though. Regular readers will remember our problem with no oven in Salzburg. While that was extreme, it’s not exactly isolated. Here in Jerusalem we have only a little toaster-oven available to us – the main oven is sealed off with tape lest we break the kosher rules with it. Most of the kitchen is, in fact, taped off for the same reason; leaving us working with a limited range of utensils in a kitchen that resembles a crime scene. But even in places without religious restrictions on how to cook, there are limitations set up by whomever fitted out the kitchen. We’ve found it’s rare to find a potato peeler anywhere – perhaps potatoes are not proper holiday food. (As an aside, a potato-peeler is a no-brainer as an add-on to the next edition Swiss army knife in my view.) Most places have a microwave; and most don’t have a large dish to put in it. And a colander? Well don’t start me on the subject of how a kitchen is supposed to work without something to drain the pasta. Then there’s the grocery shopping itself. Australia, it appears, has a bountiful supply of fresh milk compared to anywhere we’ve visited so far. Germany was big on UHT milk – but then the Germans choose to put fake creamer powder in their coffee, go figure. Egypt and Jordan have fresh milk, but should have UHT as they seem to have the milk at room temperature. 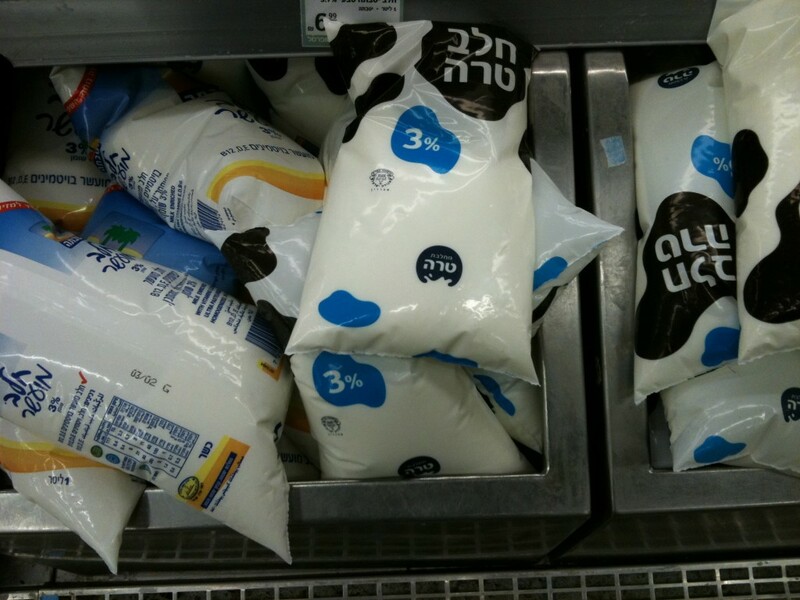 In Israel milk comes in floppy plastic bags and costs a bomb. We still have absolutely no idea how to work with a plastic bag full of milk without turning it into a Jackson Pollock like art activity. The whole healthy breakfast cereal thing seems to have passed the rest of the world right on by. 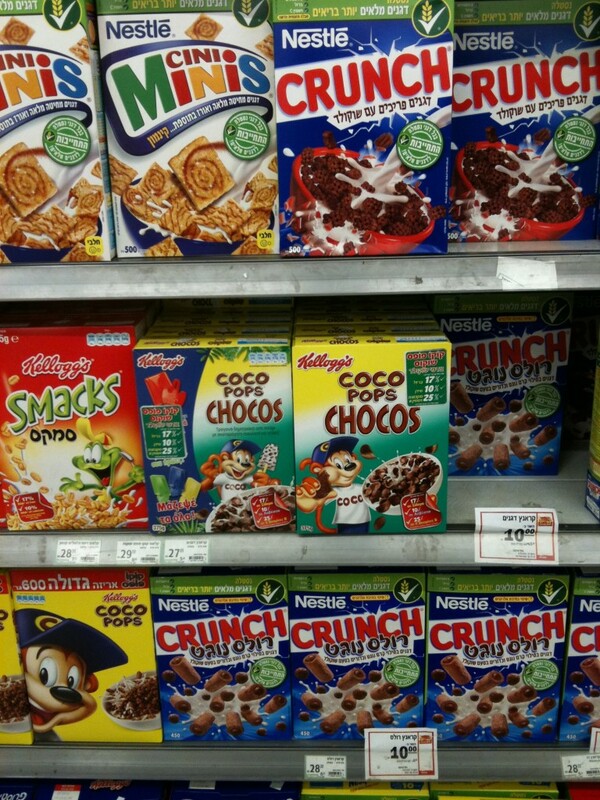 At first the boys thought they were in heaven in the cereal isle of the supermarket. They’ve now come to realise the lengths their parents will go to to find something, anything that isn’t coated with chocolate. I’m not kidding, at home Cheerios were a treat for the boys, here they are the healthiest thing in most supermarkets. You’d think pasta would be fairly straightforward. The basic dried stuff is wonderfully ubiquitous. The fancier, filled varieties which the boys adore are more complex. In Austria they came only in tiny portions. Here in Israel it’s either tiny, expensive portions, or huge portions of a Russian variety. We tried the Russian variety the night before last – on economic grounds and in spite of the fact there was only Cyrillic on the pack – and it proved very tasty, if subtly different to any pasta we’ve had before. Chernobyl? In Chinese supermarkets, they don’t do the little bags of rice or bottles of spices. Rice was in sacks – big ones. Spices were set out in bins and you’d dip in and scoop your spices into plastic bags in industrial quantities. Then there are wonderful fruit juices available. The lime juice in Singapore was just stunning, and we’re mildly addicted to the cherry juice available throughout Europe. And you can’t talk food without mentioning the bread and cakes. Even China had a quality bakery delivering delicious bread and wonderful pastries in the middle of the supermarket. German bread was solid and tasty. Jordanian flat-bread had a wonderful smoky taste. Israel does a great line in cinnamon rolls and other Danish pastries. Don’t get me wrong, none of this is a complaint. The wonderful thing about long-term travel is that things that would irritate when at home or on a timetable just become entertaining when put into a longer-perspective. 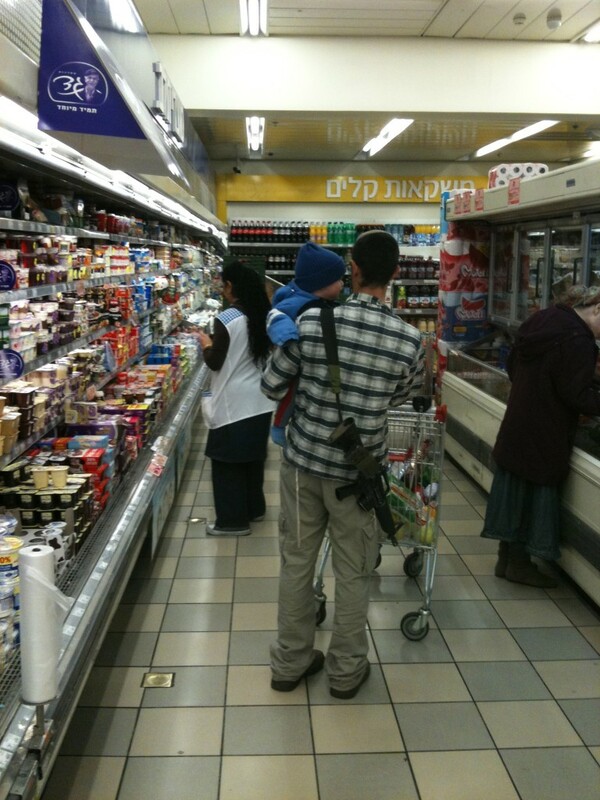 Today we bought our groceries from the local supermarket complete with local Israeli colour. We had chicken pasta for dinner, cooked in a dark kitchen eerily lit from the hall-light reflecting off our crime-scene-tape-kosher-protection. The kitchen light has short circuited and requires professional fixing not available until tomorrow. It’s all part of the adventure. In South Africa, we used to get milk in plastic bags too. Every household had a plastic jug in which they’d place the milk and then snip off the corner for easy pouring. Maybe your crime scene kitchen has one secreted away in the milk section. We assumed that had to be the case, but it’s nice to have it confirmed. Seems a way of generating a lot of non-recyclable plastic bags for no great benefit. Or is there a benefit? I second Charlotte – in the late 70s/early 80s when glass milk bottles were being phased out in Australia there was a period when those plastic bags were all the rage, but you had to have the hard plastic jug to put them in for them to work. Also, it was at a time when milk was still home-delivered (where I lived anyway) and the magpies (?) 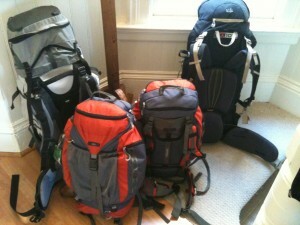 just loved to peck holes in the bags left on people’s front steps. It was a short-lived fad. fascinating … would love to see a photo of THAT kosher gaffa taped crime scene kitchen. Visiting grocery stores in foreign countries is one of my favorite things to do on trips. Thanks for the inside look into ones there!